Gadiara is a village in Howrah District of West Bengal, India. This place is the point of convergence of the Damodar, the Rupnarayan and the Hoogli rivers. Gadiara is a popular picnic and daytrip spot for locals and tourists alike. 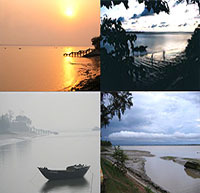 Visitors can enjoy boating in the Rupnarayan river. Both sunrise and sunset in Gadiara are really worth seeing because of its vast waterfront resembling a sea. But, today, the calm and quietness of Gadiara is gradually disappearing and becoming congested. 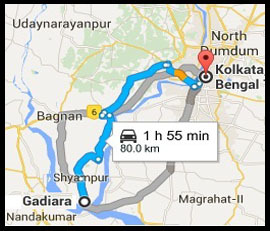 There are regular ferry services to the other side of the river i.e., to Geonkhali in Midnapore and to Nurpur in 24-Parganas. Day 2: SIGHTSEEING AT MOHONA, GARDEN ETC. AND BACK TO KOLKATA IN EVENING.